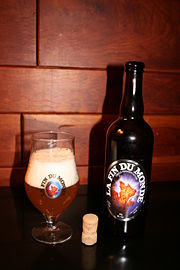 The La Fin Du Monde came heavily recommended from a loyal Beer Crusader. The beer is a triple fermented Belgian style ale that has a golden color and light head. The beer has a floral dry taste, with hints of citrus. I believe Belgian Ale and Hefeweizen fans would really enjoy this beer. Unfortunately, I am not the biggest fan of either of these styles or while we are at it Stouts. I believe beer should taste like malt and barley and hops, not pot pourri. The La Fin Du Monde, does pack a wallop which I like, it has a 9% ABV. I am giving the La Fin a 2, with the understanding that fans of the style would rate it much higher. This review helps me to recognize that my tastes and the Beer Crusader's tastes are not totally aligned. I'd give La Fin Du Monde a 4.0, as it is a very good beer. I'm with Mike on this one, but I really enjoy Belgian ales. Sorry Belgians and Stouts aren't my cup of tea. I am more of an IPA, Pale Ale, Brown Ale person.